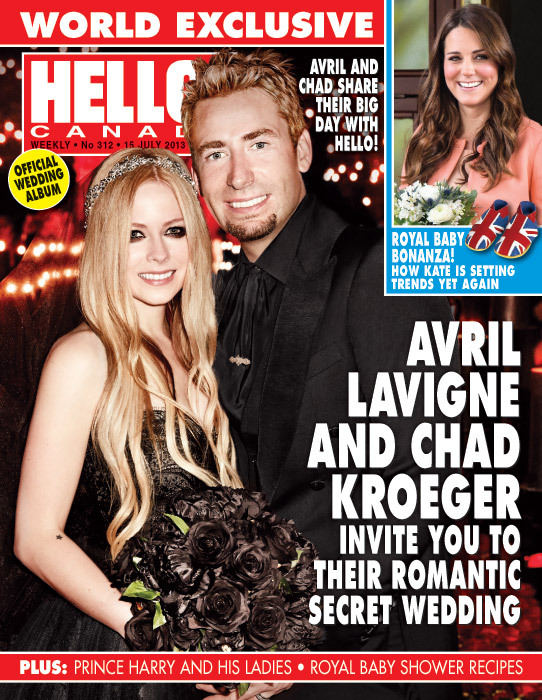 –Avril Lavigne says she wanted her wedding to be “over the top.” From the looks of things, mission accomplished! –Kerry Washington is having a great week. Yesterday her new Vanity Fair cover debuted, and today it came out that she secretly married football player Nnamdi Asomugha last month. Looks like she learned a little some about keeping secrets from her Scandal character. –James Franco wants to continue interpreting William Faulkner classics. This time, he’s setting his sights on The Sound And The Fury. And this is why we can’t have pretty things. -Meanwhile, James slammed Zach Braff’s Kickstarter campaign. Um, he knows he’s doing one too, right? –John Barrowman celebrated DOMA’s overturn by marrying his longterm boyfriend. Mazel! –Alec Baldwin continues to say things. Lots and lots of things. –Bryan Cranston is getting a well-deserved star on Hollywood’s Walk of Fame. Aaron Paul and Jane Kaczmarek are set to pay tribute. -Meanwhile, a Breaking Bad spinoff featuring Saul continues to inch closer to reality. –Jay-Z just previewed the art for his new album Magna Carta Holy Grail beside the actual Magna Carta! -Meanwhile, he got all choked up when talking about wanting to be a good dad. –Russell Crowe claimed his Twitter was hacked after he posted a photo of a va-jay-jay. –James Gandolfini‘s children are set to inherit the bulk of his $70 million estate. -Here’s what a Barbie with an average woman’s measurements would look like. Demi Lovato approves! –Tom Cruise turns 51 today. Yup, we’re old. –Lindsay Lohan reminded everyone on Twitter that it was her birthday, and then we all felt really sad for her. –Michael Cera says he was mugged in Chile. I guess his tough guy demeanour wasn’t intimidating enough. –Amanda Bynes insists she and Drake have “mutual crushes on each other.” Uh huh. -It looks like Busy Phillips just had her baby, judging by this Twitter update. –Beyonce is bragging about eating In-n-Out burgers. Somewhere, Jennifer Aniston just had an aneurysm. -ABC Family may renew Bunheads yet. –Riley Keough‘s rep insists she wasn’t the girl photographed with Robert Pattinson this weekend. Weird. You’d think a publicist would want to milk this for all its worth, real or not. –Kaley Cuoco, on the other hand, is now getting papped everywhere. She was even photographed on a “hiking date” with Henry Cavill. Someone’s getting a raise for this. -This photo of Vinnie Van Lowe on the Veronica Mars set makes me stupidly happy. –Julianne Moore looks stunning in her new Reed Krakoff campaign. –Helen Mirren thinks the new Doctor Who should be “black, female, and gay.” She also thinks troubled starlets would be a lot less troubled if they weren’t always “up their own bum.” In conclusion, Helen Mirren is awesome. -I didn’t even recognize Chris Evans in these photos. -This is kind of cool. Emma Watson created a fake Tumblr for her Bling Ring character. -The first trailer for Delivery Man, starring Vince Vaughn, has landed. It’s a remake of the French-Canadian hit Starbuck.